The Learning Management Team (LMT) is comprised of a student, their parents, teachers, and other people tracking the student's progress. These people can include certificated members of the school or district, and Afterschool Professionals i.e. people working with the student who, with parental consent, have access to homework information and communications rights. Go to the Student Record and click the Join Team button in the Learning Management Team section. You will be asked to create a new tracker or add the student to an existing tracker. Go to a personal tracker and add the student. You will automatically become part of the Learning Management Team for all students you track. You can track as many students a you want in a single Personal tracker. Your name and Relationship (from the Position field on your account management page) will be listed on the Student Record, and you will be included on LoopMail sent to the team. Select one or more students in the list. NOTE: Any Staff member who clicks the New Message button in the Learning Management Team section of the Student Record can address the message to any or all of the members of that student's Team. NOTE: Teachers have access to the same list of team members when addressing a LoopMail message using the list called "Their parents and teachers (individuals)." Parents and students can access the list of Teachers and other members on the Team by clicking the Email all teachers link from their portal homepage. Learning Management Team members are always in the loop. If you are unable to see the "Join Team" button in the student record, the student is probably in your class, so you are already on the learning management team. If you are not listed on any learning management teams for students in my tracker, only personal trackers place you on the learning management team of students in the tracker. An admin can auto-login to the staff's account and delete the tracker. (Click on the tracker to enter it; click Delete Tracker on the right side.) 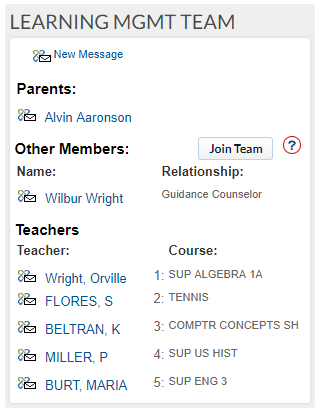 For individual students, the admin can go to the Student Record page and click Leave Team on the right side. The new relationship entered reflects in the LMT tool when re-visited.